Woohoo! It's that time of year again. This is my second year participating in Blogfest. 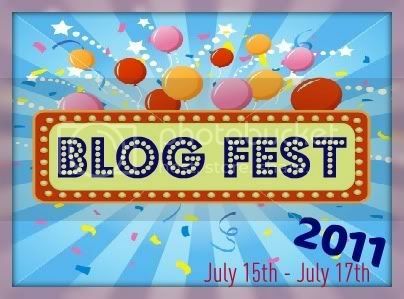 What is Blogfest you ask? Only one of the biggest blog parties evah! There are tons of blogs participating and lots of prizes just waiting to be won. This event is hosted by Cinnamon @ A Journey For Books. The party runs from July 15 to July 17. Make sure that you stop by each blog to see what bookish prizes are up for grabs. I have two prizes to give away. To enter my giveaway, you must be a Google Friend Connect Follower of this blog (this will be checked) and you must make a comment to the post stating which prize you would prefer. There will be two winners. Giveaway is only open to US residents (sorry international friends!) Winners will be announced on the blog later next week and will need to email me their mailing address. I'd love to win Prize #1. Thanks so much for hosting - I would love to win either prize 1 or 2. Both look great! Awesome! Count me in from prize #1. Thanks for the giveaway! I'd like the YA pack! I follow this blog! I'm a GFC and I would like to win either Prizes.. I'd love Prize 2! Thanks for the wonderful giveaway! Thanks for the awesome giveaway. I would love either prize. Thanks for this amazing giveaway! I am a new follower on GFC as Suz and I would love to win the YA lovers prize! please enter me for Prize # 2. I'd like to have Prize #2. I would like the romance pack if I win. Thanks for participating! Thank you for taking part in the hop and for this excellent giveaway. I would love to win prize #1. Thanks for the chance! I would like to win prize #1.
i'd love the YA pack! I'd love the YA prize. I would love to win Prize #2. Thank you for the giveaway. YA Prize, please. Thanks for the great giveaway. I'd love to win Prize 1. Thanks! I would love to win the YA prize #1. follow on gfc. I couldn't find your Google Friend Connect button, but I'm sending you an email about it. I'm also following you on Facebook, Goodreads, and by email. I would like to win Prize #2. Please count me in for #2! I'd prefer prize #1. Thanks so much! I'd love to win prize #1 - the YA pack. Thanks! I would love Prize Two the one for Romance lovers. Those books sound really hot. I am an old Google Friend Connect Follower (skyla11377). I'd love Prize #2. Great giveaway. Thanks for the chance to win. GFC follower under Lucky47. I'd love to win either 1 or 2. I follow you on GFC. I would like prize one-though prize 2 looks good also. I am interested in the adult romance. Thank you for the giveaway! Would like to win prize pack #1. I would pick the YA prize. I would love to win Prize #2. I would love to win the first prize pack, please! Thanks so much for this great giveaway! Great giveaway! I'd love prize pack #1. I've heard great things about Shades of Atlantis. I want to read it lol. Thanks for the chance to win. I would love to win the YA gift pack! Thanks for the giveaway. Id love the YA books. thank you! I'd like the YA pack thanks! I'd like to win prize # 1. Thanks for the lovely giveaway! Ah hard one!!! but 1! I would prefer prize #2. I'd like prize pack 2. I would love either one! But prefer #2.